Roofing innovations are helping address the issues raised by traditional materials, be it installation time, labour, durability, sound and temperature insulation, design flexibility and other aspects. Branded products offer standard quality and dimensions. Likewise, waterproofing is an inherent part of roofing. Done carefully during the installation stage itself, there are several kinds of waterproofing available to assure of a leak-proof roof. This is surely one of the significant technological advancements suited to countries like India that experience heavy monsoons in most parts of the countries for about 3-4 months every year. Globally the non-asbestos corrugated roofing sheets are manufactured by using humid cure technology with high quantity cement which results in high density and heavier sheet weight. “HIL limited developed breakthrough technology of non-asbestos corrugated roofing sheets by employing autoclave method with lesser quantity of cement which results in low density and light weight sheets. The product manufactured by this method has low drying shrinkage feature as compared to humid cure non-asbestos and asbestos fibre cement sheets and hence superior performance and durability is expected when stored,” says Dhirup Roy Choudhary, CEO & Managing Director at HIL Limited (CK Birla Group). In conventional non asbestos roofing sheets raw material used are cement, lime stone, micro silica, and bentonite as binders and poly vinyl alcohol, polypropylene and wood pulp are used as reinforcement. Popularly used roofing materials in metal roofing can be classified into colour and non-colour roof panels. On the upper end of the scale both colour and non-aluminum roofing panels are used in trapezoidal roof panels as well as standing seam panels. “Alumnium roofing panels are considered superior due its resistance to corrosion, better heat insulation properties, lighter in weight besides realisation of better resale value at the ends of its life. Coating of zinc on metal is a traditional material used for very long time in Indi. Examples can be seen in the older industrial buildings as corrugated GI sheets. Earlier the Sheets were having Zinc coating of 120 GSM, and yield strength of 250 MPA. In order to improve the performance, materials with zinc coating of 180 GSM to 275 GSM, yield strengths of 345 Mpa are now being used to provide superior structural performance and resistance to corrosion,” adds Nagarajan. Specialised coating of aluminium and Zinc commonly called as galvalume have become popular in India as it combines the good corrosion resistance properties of aluminium and zinc giving users a viable alternative from the cost and performance perspective. Likewise, COLORBOND® steel is one of world’s most advanced and trusted pre-painted steel product for the building and construction industry that offers design flexibility and superior aesthetics to the overall structure; going beyond performance. Some of its variants are specially developed for the Industrial and coastal environments. ZINCALUME® steel the substrate for COLORBOND® steel ensures superior ability to resist corrosion up to four times longer than galvanised steel of equivalent coating thickness. COLORBOND® steel is not simply painted, but has a paint system that delivers longer life and superior aesthetics. “The unique composition of the paint system consists of stable resins and inorganic pigments that do not break down easily even under severe UV radiation, thus preventing fading and chalking for longer. Also the coating technology is formulated to resist cracking and peeling during roll forming and usage. The colours too are developed in consultation with world’s leading colour consultants and building professionals. One of its technological breakthroughs has been THERMATECH™ Technology that reflects sun’s heat to help roofs stay cooler thus reducing the inside temperature and overall energy consumption,” says Mahendra Pingle, Dy. General Manager, Market Development, Tata BlueScope Steel. HIL developed non asbestos roofing sheets branded as Charminar fortune is eco-friendly because no hazardous materials are used in the product, no waste is generated, by products of other industry like fly ash generated from thermal power plants, cotton rag waste are consumed for manufacturing the product. 80% of these raw materials are sourced from less than < 150 kms, 100% re-usable, and no negative social impact. The main objective of a sustainable roofing material is to reduce or completely avoid, depletion of critical resources like energy, water and raw materials; preventing environmental degradation and creating a built environment that is liveable, comfortable, safe, and productive. “THERMATECH™ technology reduces the amount of heat transferred inside the building, which results in better thermal performance and cooler comfort. In hot weather, COLORBOND® steel can reduce peak roof temperature up to 6 C. It can also reduce annual cooling energy consumption by up to 15 per cent depending on the level of insulation, colour, building shape, orientation and function,” adds Pingle. Tata BlueScope Steel is working towards creating sustainable and innovative building materials and products that will help reduce adverse impact on the environment. The thermal conductivity of the products is 0.167 W/mk against colour coated metal sheets 46w/mk hence the thermal insulation performance is expected to be superior than colour coated sheets. “Since the sheet weight is relatively low, the freight cost per sheet is also low. Lower sheet weight also helps in bringing down the overall structure cost compared to other alternatives. Thus it proves to be very beneficial on all accounts. The innovated products is light weight and high strength and meets performance requirement of national and international standards like IS 14871, EN 494 and ISO 9933,” says Choudhary. Likewise the market has several coatings you have for waterproofing. 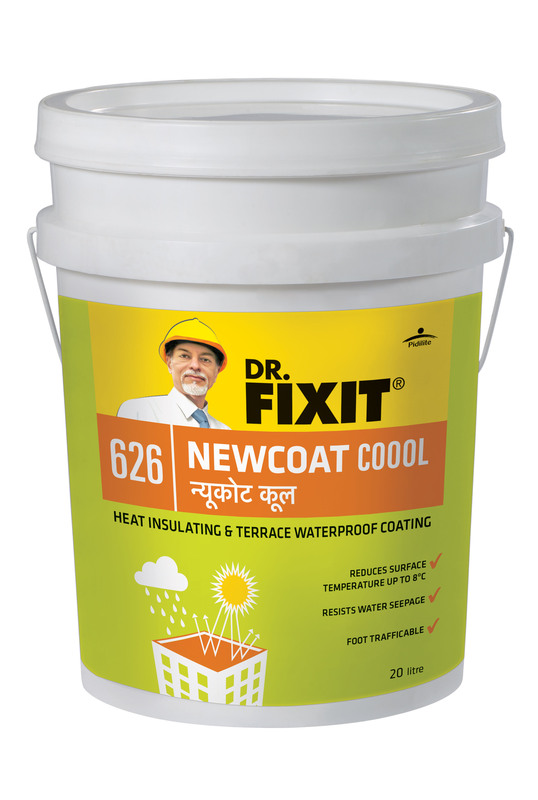 Pidilite Industries Ltd. has the largest range of coatings in the Indian waterproofing industry from the Dr. Fixit’s stable. “We provide cementitious, acrylic, bituminous, polyuria and other hybrid coatings. These coatings have myriad applications based on the surfaces that they are applied to. As the range of the products in our portfolio is fairly wide, it would be difficult to comment on how distinct these products are; as one product used for a particular surface will not be relevant to a different surface,” says Dr. Sanjay Bahadur, Global CEO, Construction Chemical Division, Pidilite Industries Ltd. The distinctiveness of the product is based on several parameters such as performance expectation, life, elongation and the overall durability and sustenance of the product at large. Aquaseal Waterproofing uses different waterproofing coating systems such as acrylic, crystalline, polyurethane based systems. Each of these coating systems has its own unique properties. -Acrylic coating systems are of two types, A Two component Acrylic Coating System (2K) and Crystalline Coating Systems. “A two component acrylic coating system (2K) is one which is mixed along with a polymer modified powder and is used predominantly in waterproofing of wet areas such as bathrooms, utility etc. These coatings are flexible in nature but cannot be left exposed to sunlight on the other had a single component acrylic coating system (1K) possess more or less the same flexibility and strength but can be left exposed to sunlight,” says Manish Bhavnani, Proprietor, Aqua Seal Waterproofing Solutions. Crystalline coating systems are active systems i.e. their nature of developing insoluble crystals in a concrete structure is through the life of the concrete. This system acts as a catalyst in the concrete member to initiate the growth of crystals so as to stop the entry of water the minute the structure is exposed to water. This system gets stronger and stronger in the presence of water which is ideal to treat tricky leaks. Polyurethane based coating systems possess high flexibility and strength having elongation of about 250-1000%. These systems are ideal for large span of areas such as terraces, podiums etc. They form a seamless coat without having any joints. Innovations in water proofing are also being seen in the market. 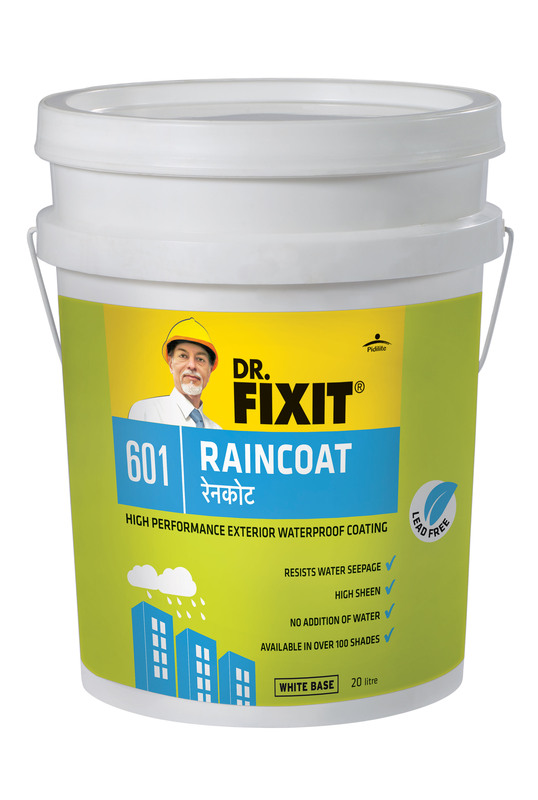 In the last one year, Pidlite have introduced two revolutionary products in the Raincoat range being “Raincoat Select” and “Raincoat Waterproofing Coat” which are specifically used for waterproofing exterior surfaces. “Along with us, specifically for roofs, we have introduced “Dr. Fixit Raahat” which is essentially a waterproofing + insulation solution, which can be used in slums and industrial buildings, as it acts as a technologically superior and long-lasting product; when compared to aluminum sheets. These products have a strong proposition and we are certain that they will have a way forward; due to the benefits associated with them,” says Bahadur.